I have spent the month of July dedicated to creating and growing in my craft, and it was life-changing. I do not say that lightly; every day I learned something new and I taught myself over and over what commitment and growth look like. So many lovely people wrote to me asking to help them with their own challenges, so I decided to put together an official 15-Day Content Creation Challenge. I didn’t set out to do that this July, but here it is, and I am really proud of it. Create work that you’re proud of, everyday, for 15 days straight. Your first email will arrive on August 1, and the official 15 day challenge begins on August 2. 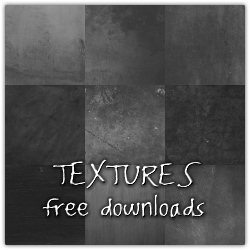 However, you can go at your own pace as all of the materials are downloadable! Have you noticed the challenge is PAY WHAT YOU CAN? I mean that in every sense of those words. If you can’t afford to buy online classes, pay only what you can. If you know someone who could really use this, give a donation in their name so that they can receive the content. I want you ALL to benefit from this. And I know that where one person can’t give as much, another person is there to balance things out. The world is kind of wonderful like that. I am doing this because I had a transformative creativity challenge and I want you to experience that as well. Even more importantly, 40% of the donations will be given to THE LIGHT SPACE, photography school for survivors of human trafficking and abuse in India and Thailand. This is how I fundraise for my charity, so if you can give, it will be put to great use. Our first group of Thai students are graduating in just two weeks thanks to your generous support in the past! 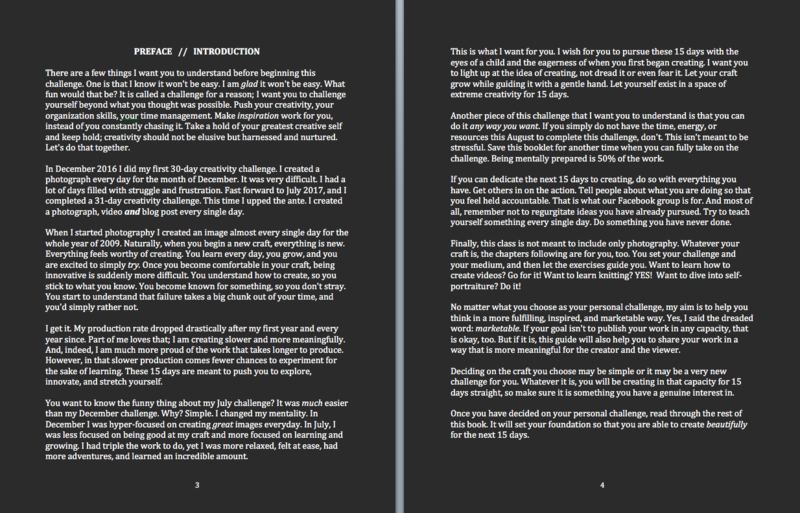 Outlining that day’s theme and challenge with examples and tips to help. Sharing my exercises and processes for content creation. A spreadsheet that helps organize all your necessary 15-Day Challenge notes. Access to our Facebook group so you don’t give up on the challenge. In the form of your own commitment to furthering your craft. You might notice some of the content is similar to previous challenges, while other parts are quite new. I put this e-book together in a way that is specifically geared toward this challenge and is meant to help our task at hand. If you have completed some of the exercises before, they need to be done again. I personally completed every challenge in this e-book during July. Signing up costs as much or as little as you want, or as your budget allows. Please do not be shy in signing up, or feel that any amount is too little. I want you to have this. I really do. So go for it. Q: When do I begin receiving the content? A: August 1, 2017. You will receive the e-book on the first day, which also outlines the daily challenges, and you will officially begin creating on August 2, 2017. The challenge ends on August 16, 2017. Q: I don’t have time this month, but registration closes on July 31, 2017. Should I sign up? A: Yes! Though many people will be completing the challenge in August, there is absolutely no need. The content you receive can be downloaded, printed, saved and finished any time. Go at your own pace. Q: Will you be offering personal feedback? A: Unfortunately I won’t be able to offer personal feedback for everyone, but I will do my best to engage whenever possible in the Facebook group! Q: Is this challenge only for photographers? A: No! It is for anyone with a craft that begs to be practiced. While some of the content fits very well with photographers, almost all of it can be adapted to your particular art form. Q: What if I’m not good enough? A: You are good enough. Stop that right now. Q: Can you tell me more about The Light Space? A: The Light Space is a photography school with two missions: to empower young women with abusive histories to pursue a career in photography, and to teach photography skills to non-profits who work with survivors of trafficking to better educate and raise awareness about the growing problem. I co-founded The Light Space with Laura Price, who runs Blossomy Projects (a registered 501c3 nonprofit, which houses The Light Space). You can read more about our mission as well as donate directly to TLS here. If you want to donate but don’t have the spare cash, we are always looking for equipment donations (especially laptops with Photoshop, bags, and working DSLR cameras). Email me if you have a donation! I’ll see you via Email and our Facebook group on August 1st with your content and the promise of 15 very creative days ahead!